Pilot testcarpet under work. 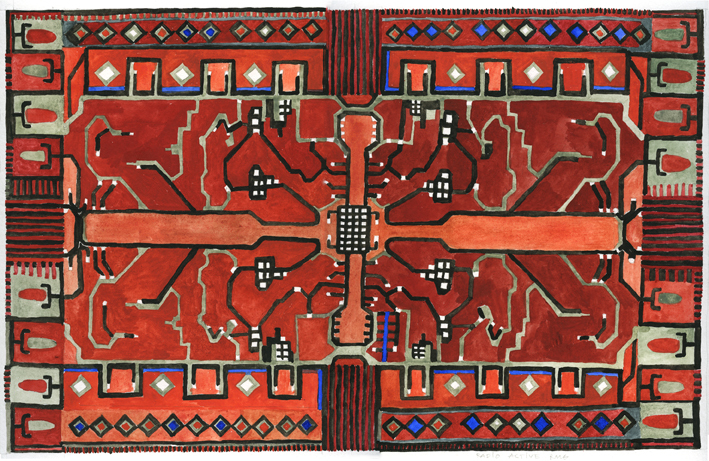 Circuitpatterned testrug with integrated cables connected to small motors making vibrations through the rug while touched. 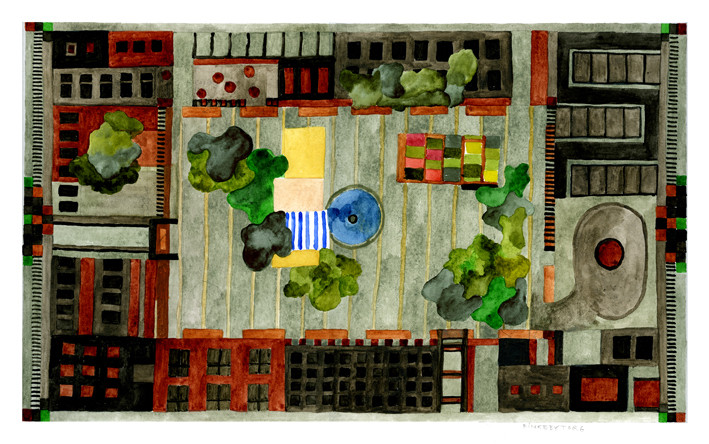 by the rug: Ulla West. by the camera: Malin Skjöld. 100×150 cm, handknotted in rya on a woven base. Tests with the rug takes place during a series of workshops in autumn 2010. 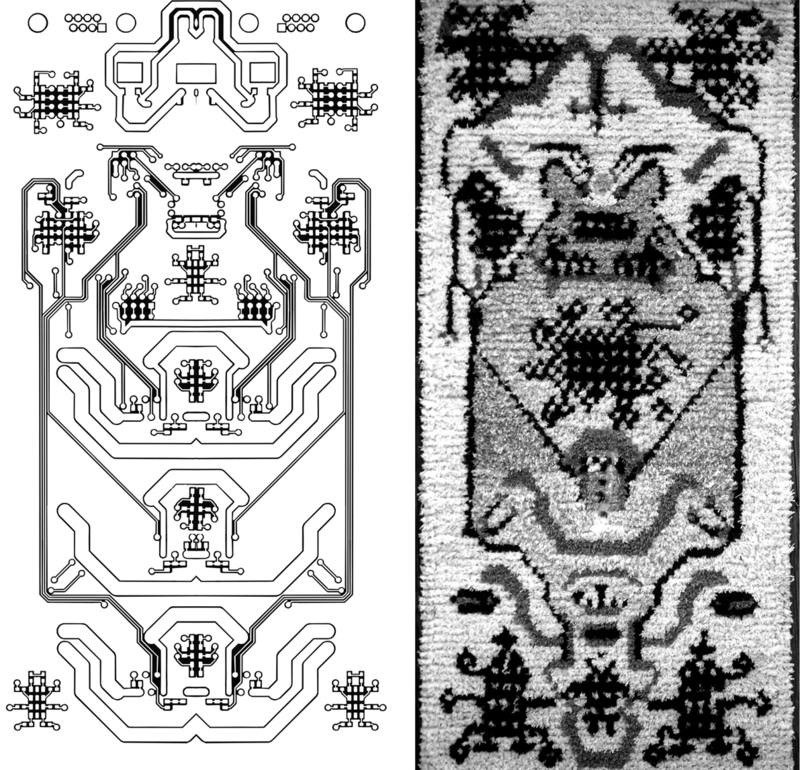 Circuit Rug 2009. The pattern is designed from the circuit board that controls the robot O#X. 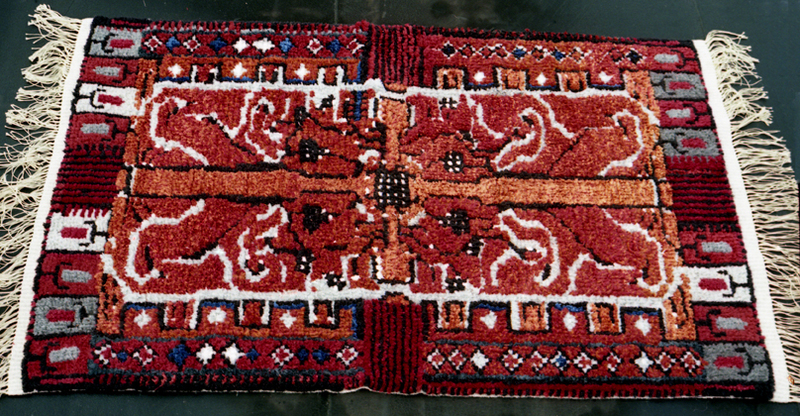 Carpet Format: 70×120 cm. Handknotted in rya. Materials: wool, linen, silk. 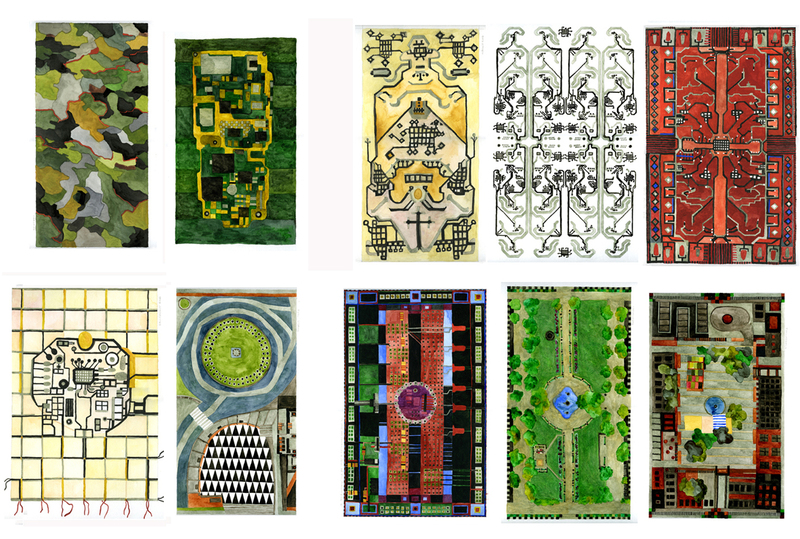 Inspired by oriental carpets, prayer rugs, yoga rugs. 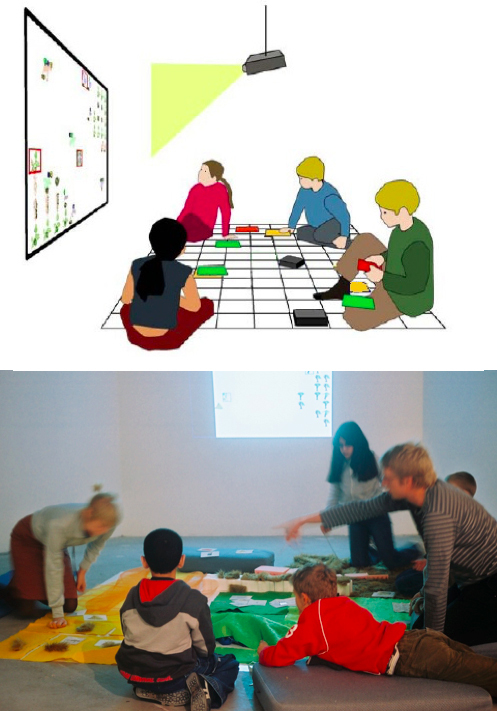 Interactive Rug – researchproject at KTH taking place at KISTA+ART 2004. Children playing to learn programming. They create a game by actions om a rug / learning the basics of programming. Ylva Fernaeus, researcher. Ulla West, curator. The rya knot is the same as iyordes also called Turkish knot. 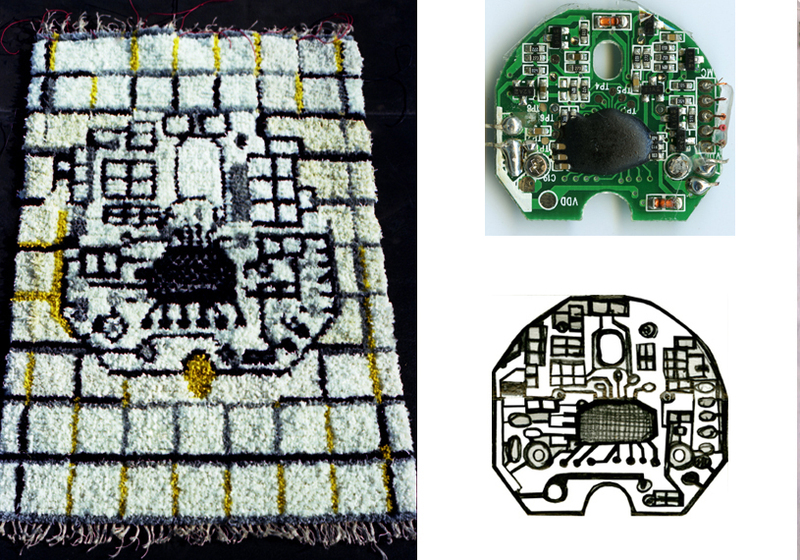 The rug has emerged during workshops and seminars in collaboration between art and research Wireless Communication at KTH, Smart Textiles Borås Textilhögskola, Science Partners and others. Project Manager Ulla West and Ylva Fernaeus, lecturer at KTH and researcher at Mobile Life Stockholm University. Radio Active Rug works with investigations around the conventional FM radio as resource and base for communication and culture. Traditional radios already include textile elements of its speakers and sound players. Radio stations contain textile materials into their microphones. We plan to make two rugs based on this simple concept. 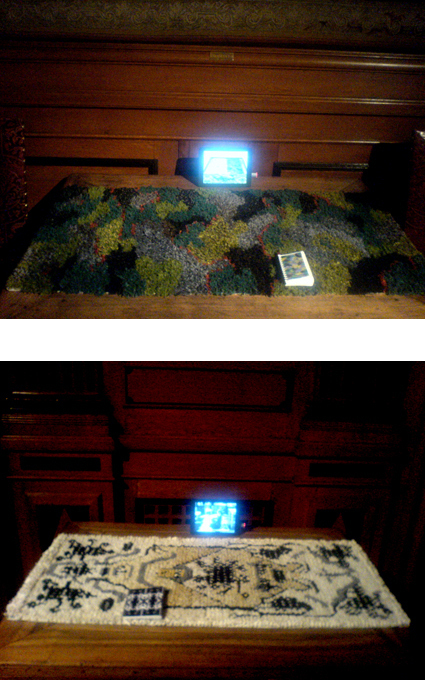 A carpet will act as an FM receiver. People on the rug guide and influence the reception of the antenna in different ways. The second rug functions as a local radio station. Activities on and around the carpet becomes broadcasts to FM receivers in the neighborhood. Cooperation between Ulla West and Ylva Fernaeus started in 2003 on the one-year research program Art and New Media, at Royal Institute of Arts / KKH. Previous collaborating projects: Pixel Express KKH, Finger Tips DSV-SU, Resources – The aesthetics of the necessary MEJAN ARC, Embodied Programming Smart Textiles-DSV. Sketches: nr 1 – 6 have been realised.